Abstract. The Variable Infiltration Capacity (VIC) model is a macroscale semi-distributed hydrologic model. VIC development began in the early 1990s and the model has since been used extensively for basin- to global-scale applications that include hydrologic dataset construction, trend analysis of hydrologic fluxes and states, data evaluation and assimilation, forecasting, coupled climate modeling, and climate change impact assessment. Ongoing operational applications of the VIC model include the University of Washington's drought monitoring and forecasting systems and NASA's Land Data Assimilation System. 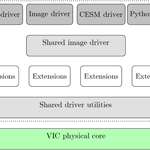 This paper documents the development of VIC version 5 (VIC-5), which includes a major reconfiguration of the legacy VIC source code to support a wider range of modern hydrologic modeling applications. The VIC source code has been moved to a public GitHub repository to encourage participation by the broader user and developer communities. The reconfiguration has separated the core physics of the model from the driver source code, whereby the latter is responsible for memory allocation, preprocessing and post-processing, and input–output (I–O). 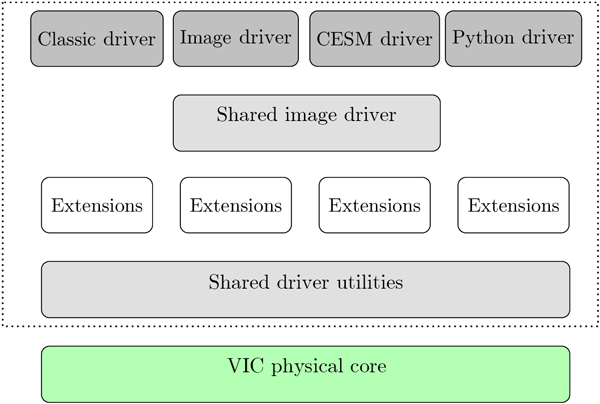 VIC-5 includes four drivers that use the same core physics modules, but which allow for different methods for accessing this core to enable different model applications. Finally, VIC-5 is distributed with robust test infrastructure, components of which routinely run during development using cloud-hosted continuous integration. The work described here provides an example to the model development community for extending the life of a legacy model that is being used extensively. The development and release of VIC-5 represents a significant step forward for the VIC user community in terms of support for existing and new model applications, reproducibility, and scientific robustness. How to cite: Hamman, J. J., Nijssen, B., Bohn, T. J., Gergel, D. R., and Mao, Y.: The Variable Infiltration Capacity model version 5 (VIC-5): infrastructure improvements for new applications and reproducibility, Geosci. Model Dev., 11, 3481-3496, https://doi.org/10.5194/gmd-11-3481-2018, 2018.